With a rustic design perfect for outdoor gatherings, the OW Lee Ridgewood Sofa Set with Marina Fire Table seats up to five in outdoor furniture that is both durable and comfortable This set is carefully crafted with Plush Comfort™ cushions that are guaranteed to provide enhanced softness and resist fading, mold, and mildew. The cushions are removable for easy replacement and come in a variety of colors. 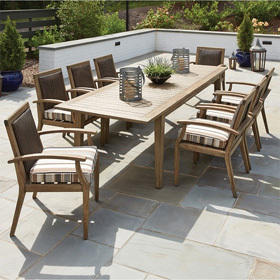 At the center of this set is the Marina Fire Table to provide your gathering with year round warmth and light. Keep food and beverages near by with a pair of stylish end tables. This made in the USA set comes in your choice of colors and includes free shipping. Lifestyle Photo: Shown in Terra Antigua Frame Finish, Sofa in Sparkle Mushroom (OD59AA), Club Chairs in Momentum Rustic (OD74C), Table Tops in Marina. Sofa 81.25"W x 36.25"D x 39"H 185 lbs. Swivel Rocker 29.5"W x 36.25"D x 38.75"H 84 lbs. Spring Base Lounge Chair 29.5 x 35.25"D x 41"H 49 lbs. Ottoman 29.5"W x 23.5"D x 18"H 26 lbs. Fire Table 58"W x 36"D x 19"H 243 lbs. Side Table 24"W x 24"D x 20.5"H 43 lbs.